A trio of Resident Evil titles coming to Switch. 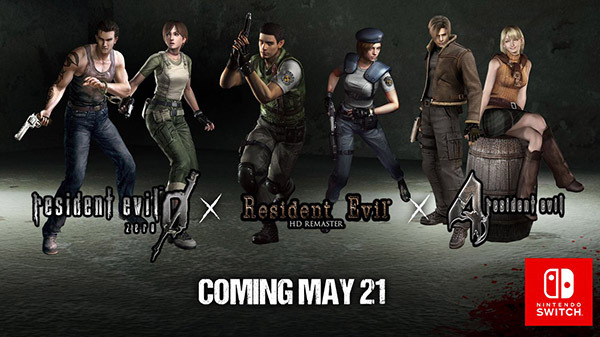 Resident Evil, Resident Evil 0, and Resident Evil 4 will launch for Switch via the Nintendo eShop on May 21, Capcom announced. Pre-orders will open on February 28. In North America, a Resident Evil Origins Collection including Resident Evil and Resident Evil 0 will be available at retail. In Europe, a retail release is not planned. All three games are currently available on PlayStation 4, Xbox One, and PC, as well as other platforms. static images, plus animated 3D models. High-Quality Sound – The audio has been remastered to increase the sampling rate, and of course 5.1 channel output is also now supported. The story of Resident Evil 0 takes players back to 1998. Reports have been mounting about unusual murders on the outskirts of Raccoon City. The city’s Special Forces division, S.T.A.R.S., sends their Bravo Team – including rookie cop member Rebecca Chambers – to investigate. On route, the team’s helicopter suffers engine trouble and is forced to make a crash landing, where they find an overturned prisoner transport vehicle. Splitting up to search the area, Rebecca discovers the Ecliptic Express, a train stopped dead on the tracks. Inside, she meets death row convict and ex-Navy lieutenant Billy Coen. Throughout the game, you will take control of both Rebecca and Billy, at times switching between both characters in order to proceed. Learning the advantages of each character is the key to solving puzzles and surviving the nightmares that lie ahead. Fully remastered sound effects – 5.1 channel surround support provides a more experiential gaming atmosphere that best matches players’ listening environments. Wesker Mode – After completing the main storyline, you will be able to take control of series antagonist Albert Wesker, and use his superhuman abilities to power through the missions.